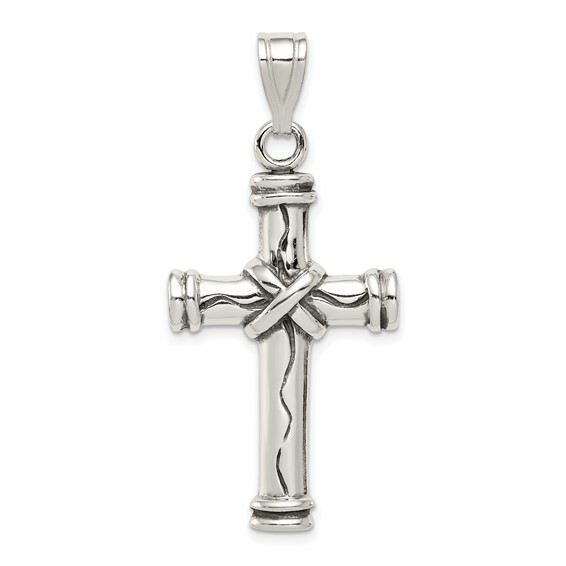 This large wrapped cross pendant is made of solid antiqued sterling silver. Weight: 5.13 grams. Measures 1 3/8 inch tall by 13/16 inch wide without bail. Flat back. Weight: 4.8 grams. Import. The product was just what I was looking for. It was of nice quality just as shown. It was not stamped as sterling silver which I think is a|necessary feature for gold or silver. The ring |was not large enough to accomadate thick chains |so I had to take it to a jewler and have a larger one put on. I like the product. It will make a nice gift for my friend. Thank you.